The Life of Bon: Take that, United! I spent a good amount of time this morning writing a "strongly worded" letter to United Airlines. I'm hoping for $2000 in travel vouchers. Think I'll get it? 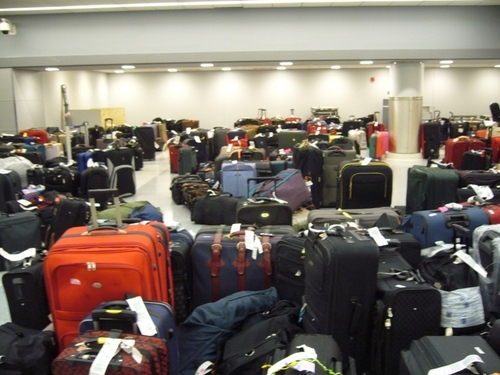 Where be my suitcase in this plethora of luggage??? I am writing to let you know of some recent frustrations I had while flying Continental/ United Airlines. On July 26-27, I flew from Chicago to London (Continental flight 6070). When I arrived at Heathrow, my bag had not arrived with me. The gentleman working at the baggage claim quickly made some phone calls and determined that my bag was in Chicago where I had had a layover. He assured me that the bag would arrive later that night or the next day since there are multiple flights that come in from the O’Hare airport each day. I left him with a contact number and an address, and he gave me a number with which to contact him with any questions. Up to this point I was patient with the error, as I realized that these things do happen, especially when you are handling what must be thousands of customers a day. However, what upset me was the treatment that I received from this point on. To start with, I was offered no kit of toiletries- no complimentary toothbrush or deodorant to tide me over until my bag arrived. Instead, I was booted out the door, left to spend my own money to buy these things for what was the airline’s mistake. After spending $1400 on one of your flights, I would think you would make more of an effort to accommodate me after your mistake. My second frustration was that I was travelling with a large group of students, and we were supposed to be leaving to Paris for five days on July 29. The bag did not arrive that day, July 27, nor the next day, July 28, as we were told it would. Countless times I tried calling the number that the gentleman had left me, but I reached an answering machine every time I called, regardless of the time of day. I called at what seemed to me the most normal business hours (ten o’clock on a Thursday), but to no avail. I left countless messages with a number to reach me at to please, PLEASE just let me know the status of my bag. I didn’t even mind so much that the bag still hadn’t arrived as much as the fact that I could not get a hold of a single person to even tell me where the bag was! The absolute lack of communication was completely aggravating. What service department never answers their phone, but instead leaves an answering machine to deal with any phone calls that might be unpleasant?! Instead, the entire group was left debating if we should go on to Paris without the bag or if it was worth it to make the whole group change their travel plans and wait a day in hopes it would arrive the next morning. I did not feel comfortable leaving for five days without a bag, nor did I want to be left behind alone in an unknown city to wait for a bag while the rest of the group went on. We tried everything to reach the baggage claim, calling Heathrow directly, looking at United’s website and following the directions to baggage claim, making phone call after phone call to United’s baggage claim. I spent the majority of my first day on vacation just trying to get someone to talk to me about my bag. Finally, late that night, after not a single word from United, the group decided to just go on with our plans to leave for Paris the next morning. We left early in the morning on July 29, and my bag still had not arrived. By this point, I had been wearing the same underwear and clothes for three days, and despite being on a very strict travelling budget, was forced to spend more money out of pocket to buy a few things to wear because your airline had not successfully brought my bag to London nor had offered me a stitch of compensation for the hassle. In Paris, the entire group was greatly inconvenienced because of the bag. Many of the other women in the group had to let me borrow pieces from their wardrobe, but that left them with fewer clean clothes and several of them had to go multiple days in a row wearing the same dirty, sweaty shirts. When we returned to London five days later, my bag had been dropped off in my absence. While I was extremely relieved and grateful to see that my belongings had arrived safely, I was frustrated that there still was no communication with the baggage claim. They left no explanation for the delayed bag, no apology for the inconvenience; it was simply a dropped off bag, as if no one could have cared less for the trouble I had endured for the last six days. I wanted this incident to be brought to your attention. While I do understand that baggage does get lost when dealing with multiple flights, I just could not believe the utter lack of communication with the baggage claim, and the complete disregard for any trouble the incident had caused me. I was surprised and disappointed that absolutely no compensation in any form had been offered to me to help ease the inconvenience. If this is how United Airlines typically does business, I certainly will not be a returning customer.